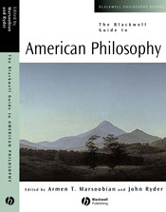 The Blackwell Guide to American Philosophy offers the most ambitious survey to date of American philosophical thought. Provides a comprehensive history of philosophical thought in America. Brings together newly commissioned essays written by leading scholars in American philosophy. Covers all of the major eighteenth-, nineteenth- and twentieth-century philosophical movements in America including idealism, pragmatism and naturalism. Examines the major figures and themes in American philosophical thought.